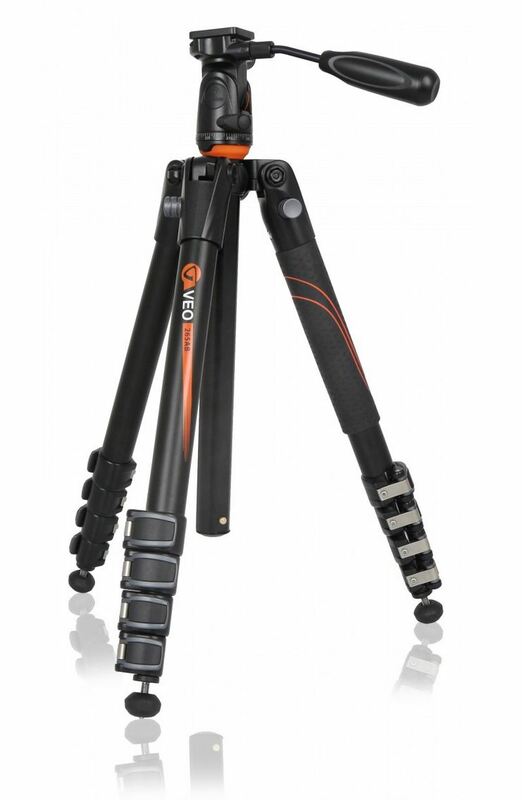 The Veo 235AP is an impressive compact travel tripod. When you’re travelling, or even if you simply have a way to walk from the car to a favourite viewing point, carrying a bulky scope and tripod can be a tiresome business. There are solutions out there of course — things like scope carriers (I use the Cley Spy MulePack to tote around my Meopta Meostar S2 on our Discover Wildlife Experiences). They make carrying bulky equipment more comfortable — but they’re of little use if you’re looking for something to make your burden smaller and lighter. That’s where a smaller tripod and scope combination can pay real dividends — but finding a decent compact tripod that retains the stability so essential to effective spotting scope use can be tricky. With that in mind I was very keen to take a look at Vanguard’s latest compact tripod offering… the Veo 235AP, complete with a smooth pan-head ideal for spotting scope use (or shooting video, come to that). 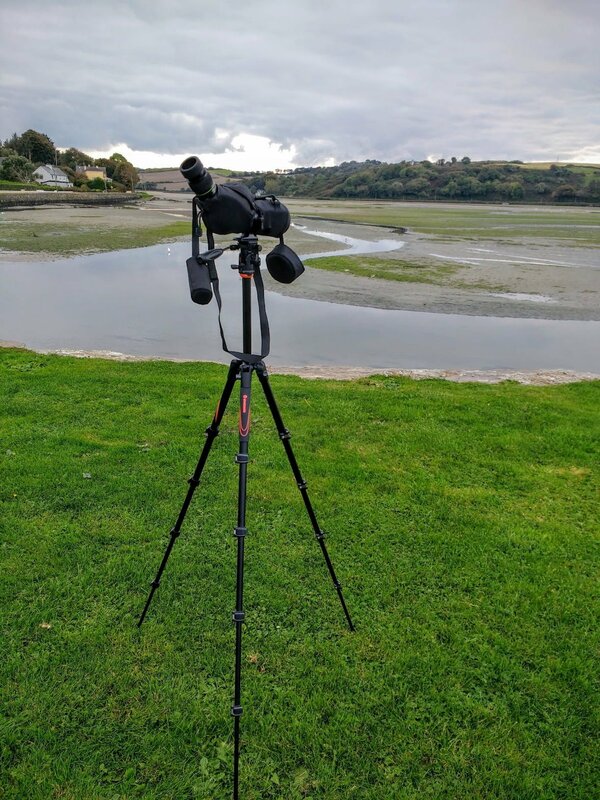 Vanguard sent a combination of the new tripod, their matching Veo 37 messenger-style bag and their flagship 60mm Endeavor HD spotting scope for us to put through their paces here at Ireland’s Wildlife. The scope is the little sister of the 82mm version we reviewed here, but being smaller and lighter is a better pairing for the compact tripod (look out for a review of this smaller scope in the near future). The fully extended Veo 235AP supporting the Vanguard Endeavor HD 60mm scope. First impressions of the tripod are very favourable. It sports an ingenious flip-over centre column that neatly folds the head down between the legs for storage. Each leg has five sections — so the whole thing folds down to an impressively compact 378mm (just shy of 15″). When I unpacked it I was sceptical that something so small could expand to be tall enough for comfortable use in the field. I needn’t have been: the fully extended height of 1,440mm (56.75″) is perfectly adequate, and even at 6’4″ tall I can use the tripod standing without needing to stoop if I extend the centre column. The most impressive part though is that a tripod this lightweight and compact can feel so stable in use. While it’s early days yet, and I need to put the Veo / Endeavor combination through their paces in a range of different situations over the coming weeks, I’m already starting to like this little tripod a lot. Look out for reviews of the scope, tripod and Veo 37 bag on the site over the coming weeks — and to stay up to date with new posts follow @WildIreland on Twitter, Like (and subscribe) to the Facebook page or join our mailing list (see form in the sidebar).